Living with diabetes can be challenging on its own, but when you’re sick, management can become even more difficult. Illness can cause your blood sugar levels to shift, and it can become harder to determine when your sugar levels are off due to already feeling pretty bad. If monitored poorly or not at all, diabetes can lead to other complications such as ketoacidosis or other long term effects. In older adults, it can be even more difficult because often they are juggling other health issues and medications. If you have ever struggled managing diabetes while sick or are unsure of steps to take if it happens to you in the future, these three tips are for you. When you are sick, it can be harder to determine your blood sugar level without testing. As a result, it is recommended to test your blood sugar at regular intervals of every 4 hours. This ensures you are constantly informed about where your levels are at and can change your diet accordingly. It is important to keep liquids in your body when you’re sick, and being proactive will only help you in your management. When the time comes to have more fluids, be sure that you are drinking liquids with a proper sugar level. If your sugar levels are high, you want to drink a sugar-free drink. If they are low, then drink something with sugar. Continuous monitoring should help you determine which fluids to take each time. 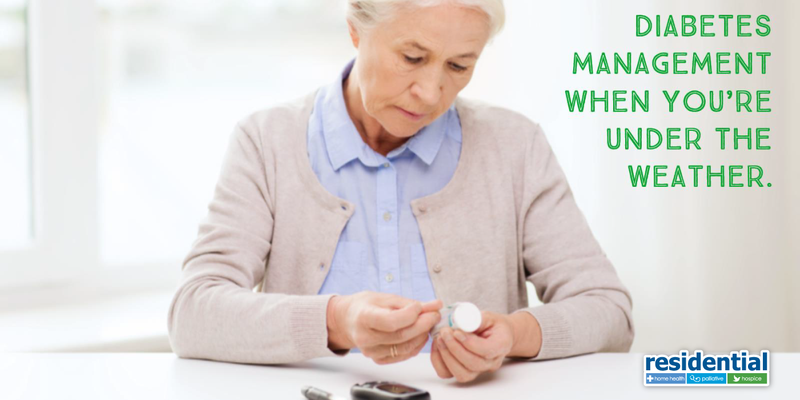 Just like how diabetes becomes harder with an illness, medication management adds another layer of difficulty, especially if a new medication is prescribed to treat the temporary illness. Some medications can cause your blood sugar to lower so it is important to know how your medications interact with each other and your body. Consult your healthcare team if you are unsure. Management can be difficult for you and your caregivers on your own, however, Residential Home Health has the team members and tools to help you manage your illness and your diabetes. Call (888)930-WELL (9355) to discuss your specific situation with a Home Care Specialist today.